RPG in a Box lets you easily create 3D grid-based, voxel-style RPGs and adventure games! Alpha Access is a followup to Founder's Access and a period during which I'd like to improve (and add to) some of the existing features before the Steam Early Access release. It is intended for those who'd like to get a head start on creating a game with RPG in a Box (or even for those who would just like to show their faith in the project by supporting it earlier on). During this time, I would like to work with the community to collect feedback and suggestions. While I cannot guarantee when or if certain features will be implemented, I am interested in finding out what functionality would be beneficial for your games. 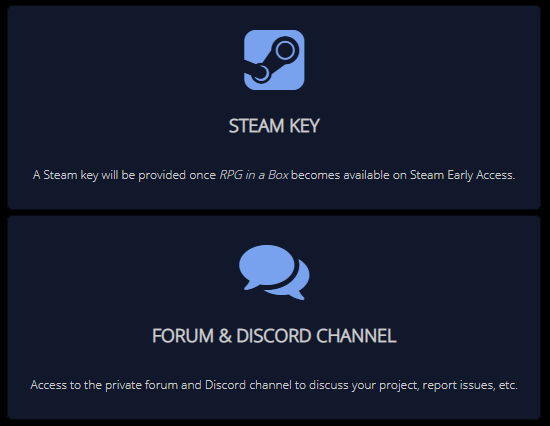 This will help me to plan ahead and to move RPG in a Box forward in a positive direction as I work towards the Steam Early Access release. Owners will receive access to the v0.5 pre-alpha test builds. Check out the section below for details on what else you'll receive by purchasing Alpha Access! Only one map is allowed per game project. Map grid size is limited to 10x10 tiles wide with a 4 voxel offset limit for tiles in each vertical direction. Exported games show a splash image indicating that the game was created with the demo version. The demo version is a great way to quickly prototype your game idea and to see if the engine meets your expectations! Game projects created with the demo version can be opened and continued with the full version (as the project formats between the two are the same).